According to Dr. Oz, various types of edible seaweeds (also known as sea vegetables) have different healing properties. Believe it or not, Wild Atlantic Nori is a natural acne fighter and does wonders for your skin. Besides containing omega-3’s, Nori boosts the natural oil production in your skin which is particularly helpful in dry winter months. Wakame, which is often used in miso soups, helps to reduce any bloating that may occur due to water in the body. Besides the benefit of reduced water retention, wakame is a great source of calcium and magnesium; perfect for women who may be at risk for osteoporosis. Kombu is an excellent source of iodine, and since our body does not naturally produce iodine, it must be available through the food we eat. Why not get your iodine from a natural source, rather than the manufactured iodized table salt? As you can see, seaweed can help with many ailments stretching from skin conditions to thyroid deficiencies. For meal ideas read the full article at doctoroz.com. Did you know that seaweed can also help you shed pounds before the summer? 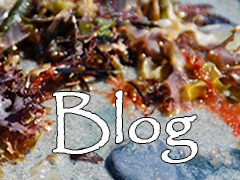 Read the article on adding seaweed to your diet.